Do you enjoy showing off your books? Or maybe you enjoy seing your shelves filled with books. While I do like my book shelves, I also find myself running out of shelf room for additional books. Enter eBooks. Readers are no longer limited by shelf space. You can own hundreds or thousands of books. But what becomes of your library? Is a list of icons on an eReader really a library? In function, perhaps yes. But poetically, books provide not only words on paper, but an environment of knowledge. With books buried inside a screen, book lovers will want to be surrounded by their books. 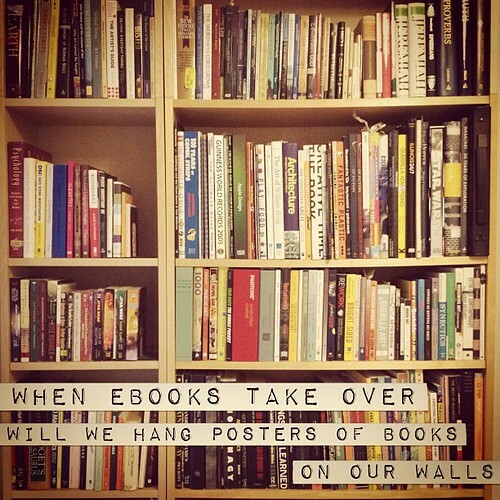 Digital bookshelf posters will be a reality. Who would like to read a book with me using a Kindle?